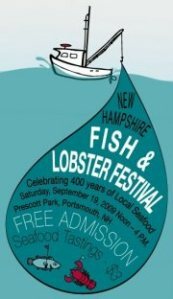 The third annual Seafood & Lobster Festival will be Saturday September 24, 2011 from 12:00 to 4:00 p.m. in Prescott Park. Celebrating the fishing traditions of New Hampshire’s seacoast, the festival allows people to tour the decks of a fishing boat, learn to identify and cook local fish and sample seafood dishes presented by local chefs. The festival is free. Sampling the chefs’ tasty offerings is just $4.00 per person. Stay at the Martin Hill Inn and you are just a 15-20 minute walk away!